Facebook recently made announcements about its latest interactive feature updates since VidCon 2016. In this large list of advanced features, Live Split Screen was one of the most interesting additions. It allows users to share two or more than two videos at once on a single screen and the best part is that their audio can be customized in entertaining way. If you are new to split screen concept then here are few interesting things to know, keep reading. Facebook Live feature is activated now and probably you might have planned lots of stuff to stream here directly. That’s great! It will help you to call your friends live chat and you will also be able to organise business meetings over here. Wow! It is really going to revolutionize the digital media. Now we can conduct employee meetings with Facebook live chat or even interviews can be schedules over here. This tool has so many applications and awesomeness of results depends upon your creativity. Part 3: How to setup Facebook Live Split Screen? Step 1: First of all you have to open Facebook application on your iPad or iPhone. Step 2: Go to news feed page and that hit the live button over there. This live button is indicated as “What is in your Mind”. Step 3: Now update a eye catching description for your video, it must be engaging enough for users so that they can spend time for your content. Step 4: Hit “Go Live” option and your stream will immediately begin online. Step 5: As soon as your stream is live, you will be able to swipe over it to get different controls at ease. Simply swipe left and it will take you to the viewers count. Step 6: If you want to add someone else to your split screen video then use Invite to Go Live button on screen. Step 7: Once you are done with your valuable information or entertainment then you can remove the stream from internet. You can simple use Cross sign to remove your viewers from a stream. Technologies have revolutionized these days and now streaming is not bound to one person only rather you can invite your friend on same stream and share screen with split screen option. This Live Split Screen Feature has been recently added to Facebook platform and it enabled two person broadcast feature even from remote locations. After Live is ended, you can choose to post your video so more people can watch it. But how to create a split-screen video and upload to Facebook without Live Split-Screen feature? In the following section, we will show you everything you need to complete a split-screen video and upload it to Facebook directly. How to Make Split-Screen Videos? 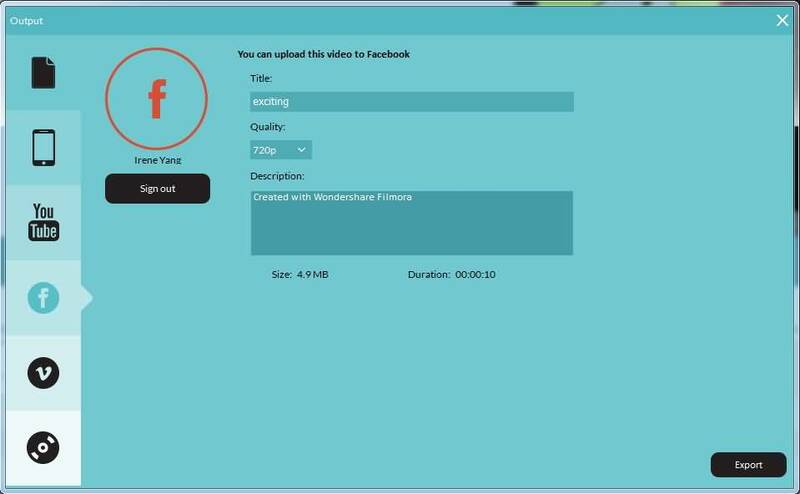 Those who are interested to create a surprising stunning video clip for their Facebook friends are advised to use Wondershare Filmora. This application is compatible with Mac as well as Windows platform and follows a user friendly interface. It offers wide range of video editing features and results can be customized using transitions or by adding background music effects. The resulting video files can be directly uploaded to Facebook with desired file format. You will be glad to know that Wondershare Filmora extends support to more than 150 media file formats along with high resolution video content. First of all you need to go online and download Wondershare Filmora from its official website. Get it installed and launch on your platform. As soon as the software gets started on your system, simply make selections for desired aspect ratio for your project. Now from the welcome window, make selection for full feature mode. There are two options to import video files to Wondershare Timeline. You can either access them by pressing Import button from timeline that helps to bring files directly to the User’s Album. Or second option is the user friendly ‘drag and drop’ tools that make everything easier for a beginner. You will find Split Screen button on Wondershare Toolbar. Select this option and it will soon lead you to the library containing numbers of split screen formats. Out of this big list, you can choose anyone and then drag it to timeline. If you don’t want to use drag and drop tool then select your present, right click over it and then from drop down menu select Apply option. One more option is to choose your present type and then hit the Plus icon available on lower right portion of thumbnail. Go to timeline and double click on your recently selected preset. You will find drop zones on your timeline to which videos can be added. Simply drag your video files and drop them in different drop zones as available one box contains a slider for time adjustments of various videos, users can access it to apply desired timing constraints. One can also add borders to videos from “Apply Border” option and the best part is that colours of these borders can be also customized to create unique effect. Now as you have added all videos to your split screen, they will naturally start playing at same time and their audio information will appear like noise. Here you need to apply some trick for sound adjustment so that viewers do not find your content annoying. The best advice is to mute one video at a time and let another one play normally. In order to mute a video file you can simply hit the Mute Track option from Drop Zone. Users can also mute both these videos and add one separate informative file in form of sound track to split screen video. You can find such sound track files in built in media library of Wondershare. Once all sound track adjustments are done then hit OK button to save the changes. As you are done with all the changes now so it is time to impress your audience. Hit the export button on Wondershare platform and select the file format for your split screen video. Use Facebook sign for selection of upload platform and sign in with your account. Add description and title information and finally hit Export button. After the export process is finished, you can click the link or click Find Target button to check your split-screen video on Facebook. Or, you can save the video in .mp4 format first and then upload to your Facebook later. To do so, click the first icon and then select .mp4 format. What’s more, you can export the split-screen video to your smartphone or burn it to DVD collection, or upload it to YouTube and Vimeo.